When you receive your order make sure to unpack your plants straight away! Give your plants a good water and allow them to drain well prior to display. 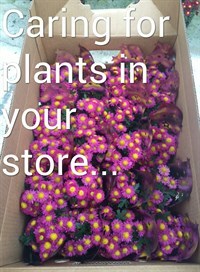 It's best to keep your plants in a bright, well lit area of your store away from freezers, fridges and frozen areas. 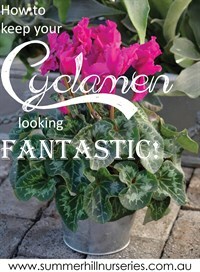 To get the most from your Cyclamen plant keep the plants moist but never wet. Make sure to drain well after watering and try to avoid soaking the foliage, liquid feed every couple of weeks using a fertiliser for flowering plants and remove spent leaves and flower stems from the base gently but cleanly. To remove spent leaves and flowers gently but firmly twist so they seperate cleanly from the corm. Kalanchoes are a variety of succulent and are very hardy and easy to keep! 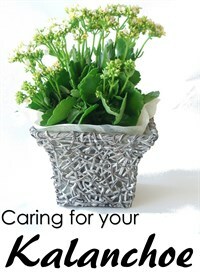 The best part of a Kalanchoe is the long lasting flower! They can hold blooms for up to 3 months! Cut off spent flower stems and pinch back leggy growth to force a compact plant. Water the plant deeply and then allow it to dry out completely before you give it further moisture. Fertilise once per month during the growing season with a flowering plant fertiliser.